Heat oven to 400º. Cut asparagus on bias in 1 inch pieces. Place on a baking sheet and drizzle with olive oil, season with salt and pepper. Roast in the oven for 15 minutes, stirring once. Remove from oven and set aside. In a sauce pan, heat the stock and water to a simmer. In a 3-4 quart sauce pan, melt the butter. Saute the onions until soft, about 5 minutes. Season with 1 teaspoon salt and 1/4 teaspoon pepper. 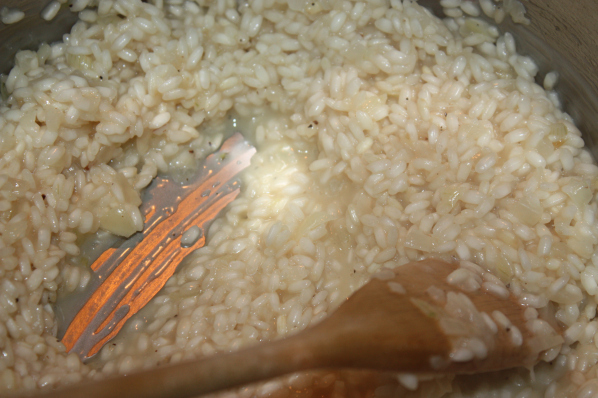 Add the rice to the onions, cook on medium heat, stirring, until rice is translucent around the edges, about 4 minutes. Add the wine, cook until absorbed, about 2 minutes. Cook the rice by adding 1 cup of stock at a time. Stir until almost all the liquid is absorbed before adding more. Keep stirring and adding more stock as it is absorbed in to the rice, until tender. 25-30 minutes total. Add the asparagus and stir to combine. Remove from heat and add Parmesan. Serve, topped with more cheese. This recipe can highlight other vegetables as well. Try it with sauteed zucchini or sweet peas (previously frozen), mushrooms, or roasted butternut squash.